Validate Security Standards and Policy- Compliance bapValidate allows organizations to distribute security standards to multiple sites and validate the implementation language associated with the security standard. BAP provides two levels of validation for security standards. One is the validation of the implementation language and the other is active threat detection related to the integrity of the security standard implemented. Let's focus on the validation of the implementation language, and then address accountability of your security environment. Many organizations have multiple environments distributed throughout the globe. Although, centrally managed organizations want to monitor and manage the implementation of security standards at the geographically dispersed sites. With BAP, an organization can define a set of security policies, develop the security standards and policies for the entire organization, and distribute to the geographically dispersed sites while maintaining validation and accountability. Understanding that every location will have variations related to their hardware, software, physical security, and process, BAP enables personalized (perhaps at the site level) to implement the security standard and policy delivered by the corporate office, while maintaining the local site autonomy to address site specific variables. The geographically dispersed environment enters the implementation language associated with each security standard into their bapFramework. Once completed, the geographically dispersed site submits their implementation plan for the security policies delivered by the central office. The central office, who created the organization's security standards and policy, has established several key phrases that will provide insight as to the implementation language applicability from the geographically dispersed site. 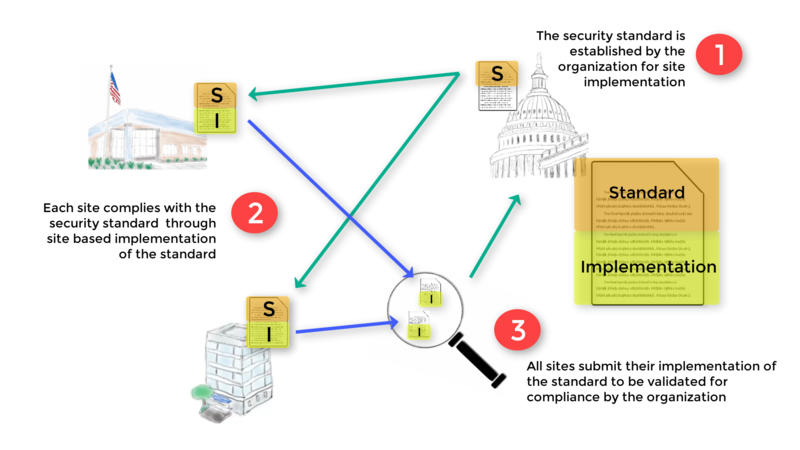 Reviewing each site and their individualized implementation language of the corporate security standards and policies is a daunting task that will produce minimal results. The BAP framework located at the BAP corporate office will allow for simplified integration of thousands of implementations from their geographically dispersed sites. In addition, the geographically dispersed site can leverage bapCheck, enabling the local site to check their answers prior to sending the implementation language to the corporate office. Whatever business model is appropriate, BAP software allows an organization to distribute central security standards and policies and quickly and easily validate the implementation language associated with those policies.